Using the daily filings from the European Short Disclosure Regulation (ESMA), we track over thirty billion Euros in short investments across more than two hundred managers. 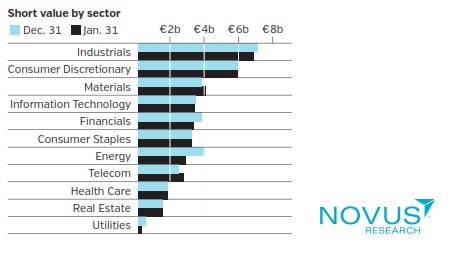 The first chart below shows changes in sector exposures and the best short picks from the past month. Also ranked are the most shorted securities, the most covered securities, and the top new shorts of the month. This January, the greatest decrease in aggregate shorted value was in the energy sector—mostly due to the merger of Technip and FMC Technologies. The best short was CGG–Veritas, with five managers shorting around twenty million Euros at the end of the month. The most crowded stock—also among the best shorts—was Pearson, shorted by five managers with an aggregate short exposure of more than 190 million Euros. Diös Fastigheter was the most shorted security by short interest, with over forty million Euros of additional capital invested this month and four new managers filing the position. The most covered security—after Technip—was TP ICAP with three managers closing the position and an aggregate decrease in shorted value of more than fifty million Euros. Displayed below are the top ten shorts and the top five new shorts of the month ranked by short interest. 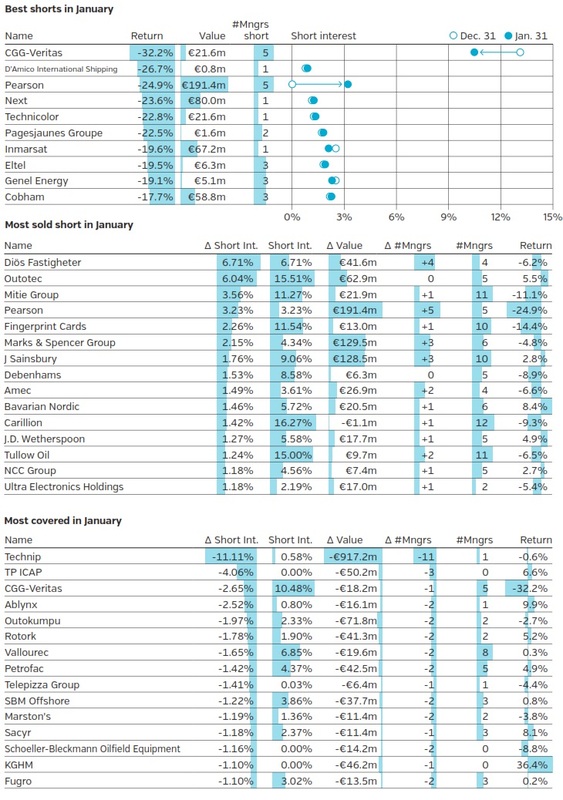 Among these, Ocado Group was the most shorted overall, while Diös Fastigheter was most shorted among the new shorts.